When buying a television set there are other things that you need to consider other than price. The features that come with the TV determine its effectiveness. If you are looking for a television set with the best performance, then you need to consider Samsung UNH65H6350. You can buy this TV from your local store or from the various shops online. Nevertheless, before you decide to buy it you need to read the following review. The television measures 57.3 inches x 14.8 inches x 36.7 inches and weighs about 60 pounds. This product comes with a television screen that measures 64.5 inches diagonally. It also features a glossy screen, a cabinet, a crescent stand, as well as a black bezel. The television LED edge backlight has a local griming pro that allow you to watch excellent pictures. You can also control the contrast of your television and set it to bring out the quality of the pictures that you need. It has a quad core plus processor, which supports different application for seamless web browsing and multitasking. The TV dual screen multitasking ability enables you to browse or stream your favorite videos while you still continue watching a football match or any other program on air. Samsung UNH65H6350 is compatible with most of android and IOS smart phones, all you need is to download free apps to allow you to use your Smartphone or a tablet as the remote control for the channels. The TV also comes with Any Net+ feature that makes it simpler to control compatible Samsung devices that you may want to use via the HDMI connections. It also comes with an Ethernet port that makes it possible for you to link it to any network connection that you have in your home. You do not need to worry about connecting your camera or thumb drive, the TV comes with 3 USB ports that you can use to connect them or for other purposes. The Samsung UNH65H6350 smart TV comes with a stereo mini jack output that can help you to connect to a home stereo or a sound bar. It has the ability to comfortably support as high as 5.1 channel audio while using streaming services such as Vudu and Netflix among others. In conclusion, Samsung UNH65H6350 smart TV is among the best television on the market. The device will not only energy efficient, but also has a high quality audio and pictures. 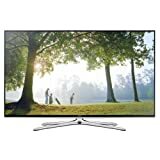 Also with the multi-function function, you can use this TV without having to switch off when others are busy watching a football match or a soap opera.